Loud Awake and Lost by Adele Griffin. Review: My eyes are blurred again, my legs were clay, propelling me in a crude, choppy, animation from the lunch table, toward the tray drop, and then towards the exit doors. Loud, awake, and lost. Have you ever felt lost? You know the feeling; it's horrible like a spider crawling on your neck and frog in your throat. This book by, Adele Griffin is another riveting, suspenseful, and heartfelt book of hers. There is drama, trouble, and emotion. Loud, Awake, and Lost will keep you turning the pages and enduring each sentence by sentence. Ember Leferrier is a normal, happy seventeen years old until her accident. A traumatic car crash leaves her broken inside and out. She spends long, and difficult months at Addington Hospital for her recovery. She feels safe and alone there - safe from everyone's sight and touch. But the day eventually comes; there was no stopping it. But although Ember dreads it, it is also exciting, at the same time. She has to go home. Going home means, she has to be put out, kicked out and thrown in a glass box for people to look at. When she gets home, her parents are the same; their house is the sameÉ as she remembered. But Ember lost some of her memory after the incident, so she can't quite figure out why her room has posters and things she doesn't remember getting. Waregirl posters? Who was that band? When she goes back to school, she's told, "You shouldn't play down what you went through, or your injuries, or the whole survivor's guilt thing." Survivor's guilt? What survivor's guilt, no one was in the car but Ember. Or was there? Ember didn't get what her best friend Rachael said to her either, "I'm so glad your back. And the best part is I can tell it's the real you." What did Rachael mean? Was there another side of Ember that she forgot? Was she her Òother selfÓ before the incident. Ember realizes she doesn't know a lot of things. Was she alone in the accident, what was she like before the incident? Were there more secrets? It is too overwhelming for Ember too think about. Was her life before the accident really this complicated? Loud, Awake and Lost is such a great book. Adele Griffin definitely paints the perfect picture in your head of what Ember is really going through. This is an emotional, suspenseful, and riveting book. There are twists and turns, and you just don't know what is going to happen next. If you love kinds of books that are mysterious and realistic fiction, then you'll love this book. This would be a book more suited for readers age 12 and up because of some adult language. It seems confusing but really, Griffin has done a great job at organizing and making what clear what poor Ember is going through. Ember doesn't even know herself anymore. "Who am I?" Ember would say. You'll just have to read and find out. 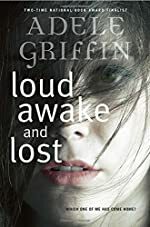 I definitely recommend Loud, Awake, and Lost as an interesting and well-written book as like many books of Adele Griffin. Who is Ember Lefrrier? Maybe she will never know herself. We would like to thank Random House for providing a copy of Loud Awake and Lost for this review. Have you read Loud Awake and Lost? How would you rate it?